Widely known as the amphtrack and amtrak (or amtrac), the LVT (Landing Vehicle Tracked) was a type of vehicle optimised for the amphibious warfare role, and was a small amphibious landing craft used initially by the US Navy, US Marine Corps and US Army during World War II. The vehicle was initially intended to carry cargo in the ship-to-shore role, but was swiftly developed into a type for the delivery of assault troops and then with the capability to deliver fire support. As such, the LVT was a decisive piece of equipment in the USA’s arsenal of amphibious assault weapons in Admiral Chester W. Nimitz’s Pacific Ocean Areas and General Douglas MacArthur’s South-West Pacific Area. The LVT had its origins in a civilian rescue vehicle, the Alligator conceived, designed and developed in Florida by Donald Roebling during 1935 as a vehicle capable of operating in swampy areas, such as the Florida everglades, inaccessible by standard wheeled vehicles and boats. Roebling’s vehicle was rendered buoyant by its watertight hull, and was propelled in the water by its tracks, which were cleated and whose submerged sections scooped water to the rear in a sort of paddling action. Two years later, Roebling built a redesigned vehicle with greatly improved water speed, and the US Marine Corps, which was currently undertaking a radical upgrade of its amphibious warfare doctrines, developed an interest in the vehicle after it had been featured in a Life magazine article. The USMC and Roebling discussed the service’s requirement and Roebling agreed to design a more seaworthy model for military use. After more improvements to meet US Navy requirements, the vehicle was adopted as the Landing Vehicle Tracked. The first LVT-1 came off the production line in July 1941, and by the end of World War II in August 1945 the Roebling factories in Florida and California, supplemented by Borg Warner of Kalamazoo, the St Louis Car Company and the Paige Motor Corporation, had completed 18,621 examples of the LVT, 11,251 of them from the four Roebling factories, in several forms. The LVT-1 was not fitted with any ramp to facilitate loading and unloading, and could carry 4,500 lb (2041 kg) of cargo. 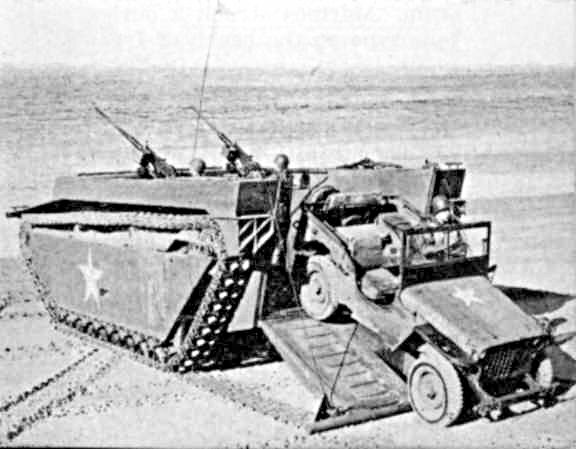 Originally intended to ferry supplies and men from ships to the shore after an assault landing and as the beach-head was consolidated into a larger lodgement in which standard wheeled vehicles could be used, the LVT-1 had no armour protection, and its tracks and suspension proved to be unreliable when the vehicle was operated over hard terrain. Built to the extent of 1,225 vehicles, the LVT-1 was capable of 15 mph (24 km/h) on land and 4 kt in water, the LVT-1 could alternatively deliver some 20 to 24 fully equipped assault troops to the beach, and supply supporting fire using its armament of two 0.3-in (7.62-mm) M1919 Browning air-cooled machine guns. 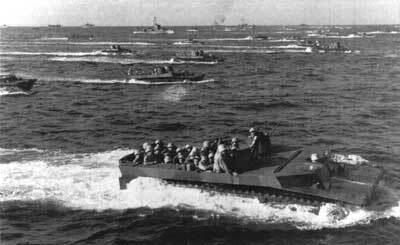 The USMC soon came to appreciate that the LVT-1, despite its limitations, could be used as a viable assault transport vehicle, and before the ‘Galvanic’ assault of Tarawa atoll in the Gilbert islands group during November 1943, many of the vehicles had been revised with two 0.5-in (12.7-mm) Browning M2 heavy machine guns forward above the enclosed driving compartment, and the two M1919 medium machine guns relocated farther to the rear. Even so, the LVT-1 was limited by the fact that it was not armoured and its thin steel hull offered almost no protection even against smalls arms fire, although before ‘Galvanic’ some of the vehicles had received 9 mm (0.35 in) of armour plating to the driving compartment. As noted above, the tracks performed well on sand, but not on hard and rough surfaces, the rigid suspension tended to throw the tracks, and roller bearings corroded rapidly in salt water. Adequate maintenance of the new machine was often a problem as few marines were trained to work on the new type, and as a result the early vehicles were prone to frequent failures. By this time the USMC was well aware of the potential of the LVT in the assault role, and this led to the introduction in 1942 of the LVT(A)-1 armoured and fire support version, dubbed the ‘amtank’. Some 510 examples of this variant were produced with a hull carrying armour 6 to 12 mm (0.24 to 0.47 in) thick, the modified turret of the M3 Stuart light tank with a 37-mm M6 gun in an M44 mount, and two rear-mounted machine guns. 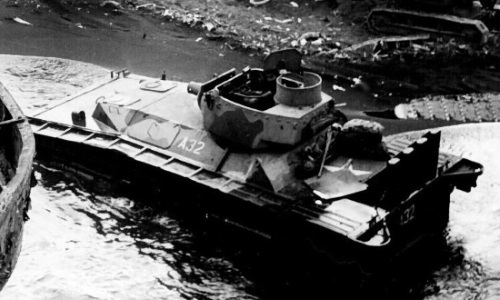 One of the first LVT actions was fought by five LVT-1 vehicles of the 3rd Platoon, A Company, 2 Amphibious Tractor Battalion of the USMC. Involved in the first wave ashore in the USMC’s ‘Ringbolt’ landing on Tulagi island, across ‘Ironbottom Sound’ from Guadalcanal island, these five vehicles beached 09.00 on 7 August 1942, only eight months after the Japanese ‘Ai’ raid on Pearl Harbor had drawn the USA into World War II. One of these unarmoured LVTs used the fire of its single 0.5- and 0.3-in (12.7- and 7.62-mm) machine guns to destroy a Japanese strongpoint while protecting wounded infantry before evacuating them to a tank landing ship lying offshore. The data for the three-crew LVT-1 included a weight of 16,900 lb (7666 kg), length of 21 ft 6 in (6.55 m), width of 9 ft 10 in (3.00 m), height of 8 ft 2 in (2.49 m), payload area measuring 8 ft 6 in (2.59 m) in length, 7 ft 9 in (2.36 m) in width and 3 ft 11 in (1.19 m) in depth, and a powerplant of one Hercules 146 water-cooled petrol engine supplied with 80 US gal (302.8 litres) of fuel for a range of 75 miles (120.75 miles) on land and 50 miles (80.5 km) on water. I believe I may have a sand mold for a component for this vehicle. I used to live in Lakeland and picked it up in a garage sale. The owner was not sure where it came from since his father had it. It has BW44 stamped on the wood. I was wondering if there is any way to identify this. Just would like to put some history to the item for my own knowledge.